The Public Health Institute of Western MA led efforts to conduct the Youth Health Survey (YHS) and Youth Risk Behavior Survey (YRBS) with 8th, 10th, and 12th graders enrolled in Springfield Public Schools in 2015, 2017, and 2019. These surveys are administered in collaboration with Springfield Public Schools, Springfield Department of Health and Human Services, Gandara Center's Stop Access Drug Free Communities Coalition, Martin Luther King Jr. Family Services, and with the support of many volunteers from the community and other local agencies. The YHS and YRBS are administered in alternating years with the Prevention Needs Assessment Survey (PNAS), an effort led by the Gandara Center's Stop Access Drug Free Communities Coalition. We hope that this data will contribute to a dialogue among school staff, community-based organizations, health care providers, and the students themselves about strategies to promote the health and wellbeing of our young people. Thank you for the generous support from Baystate Health, Beveridge Family Foundation, and Springfield Health and Human Services. 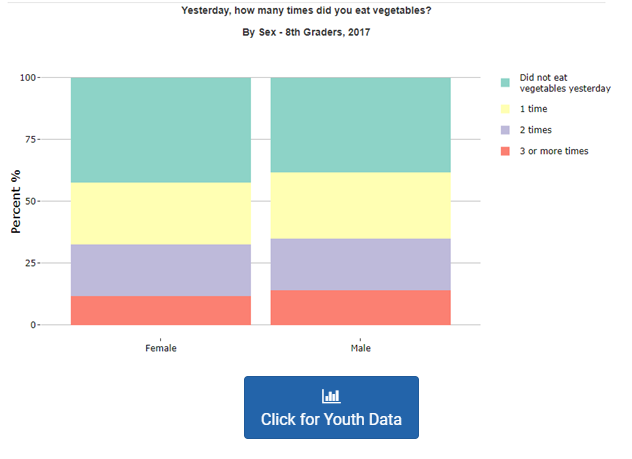 PHIWM created a user-friendly website, the Interactive Youth Health Data Portal, that allows users to visualize Springfield Youth Health Survey data in graphs and explore responses to questions by gender or race/ethnicity. Graphs can even be downloaded as images. If you notice any errors or issues with the data portal, please e-mail us. The Springfield Youth Health Survey (YHS) is administered to 8th grade students enrolled at Springfield Public Schools. It is a modified version of the survey used by the Massachusetts Department of Public Health. The survey contains questions about diet, exercise, screen time, feelings, bullying, violence, health, alcohol, tobacco, marijuana and other drugs, and more. 2017 Survey Instrument — This file is a copy of the survey instrument used in 2017, which was adapted from the MA YHS. The survey was administered online. Youth Health in Springfield, MA: Highlights from the 2015 Youth Health Survey of Eighth Graders—This report includes key results from the 2015 survey and shows comparisons to the 2013 Massachusetts Youth Health Survey. 2015 YHS- Responses to All Questions — This document provides the responses (counts and percentages) to each question in the survey. 2015 Survey Instrument — This file is a copy of the survey used in 2015, which was adapted from the MA YHS. The Springfield Youth Risk Behavior Survey (YRBS) is administered to 10th and 12th grade students enrolled at Springfield Public Schools. The instrument used in Springfield is a modified version of the survey created by the Centers for Disease Control and Prevention and used statewide by the Massachusetts Department of Public Health and Department of Elementary and Secondary Education. The survey content is similar to the YHS, and it contains questions about safety, violence-related behaviors, bullying, self-harm, alcohol, tobacco, marijuana and other drugs, communication and education about sexuality and sexual health services, and more. 2017 Survey Instrument — This file is a copy of the survey used in 2017, which was adapted from the MA YRBS. 2015 YRBS- Responses to All Questions — This document provides the responses (counts and percentages) to each question in the survey. 2015 Survey Instrument — This file is a copy of the survey used in 2015, which was adapted from the MA YRBS. MDPH Health Survey Program - This website contains information about MDPH's surveillance project to assess the health of youth. Youth Online- This CDC application allows users to access national and state Youth Risk Behavior Surveillance System data.